According to WHO global estimates, in 2014, about 13% of the world’s adult population (11% of men and 15% of women) was obese, while 39% of adults aged 18 years and older (38% of men and 40% of women) were overweight. The rate of obesity has more than doubled between 1980 and 2014. The main problem is that overweight and obesity is killing more people than underweight worldwide (this includes all people in high-income and most middle-income countries). Although health care providers can monitor an individual’s health, they face clear problems with providing treatment and direct management to the amount of people who are at risk of overweight and obesity. Self-monitoring combined with healthy weight guidelines provides an alternative solution to this issue. Fig. 1. 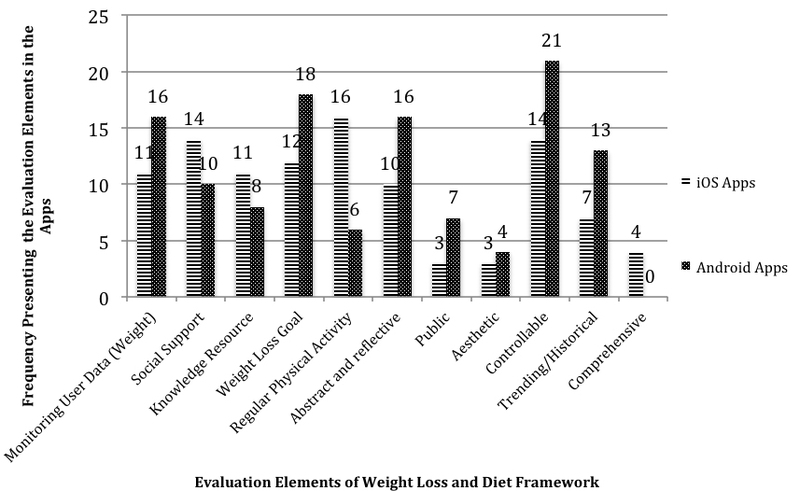 The developed weight loss and diet smartphone apps evaluation framework. Wellness technologies and wellness apps can be used to monitor users’ health and help them maintain a healthy lifestyle. Smartphone apps play an important role in monitoring and managing individuals’ weight. They provide real-time feedback and can employ persuasive technology among both chronically ill and healthy individuals. Wellness monitoring apps are redefining the concept of self-monitoring by altering the isolated process of self-monitoring into a communal, supportive process whereby multiple individuals with similar health interests can check the user’s progress and give encouraging feedback. MyFitnessPal, Lose it!, FatSecret’s Calorie Counter, and SparkPeople are some of the popular apps with features that can track diets and physical activities. Although mobile app markets (iTunes and Google Play) list hundreds of thousands of health apps, it is not always clear whether those apps are supported by credible sources. Despite the prevailing use of smartphone apps to aid with weight management, the usability features of these apps are not well characterized. The study investigated the smartphone app stores (iTunes and Google Play) in order to explore the usability features of popular wellness apps, particularly in the arena of diet and weight loss. The design of the study passed three main stages. First, it identified the most popular weight loss and diet apps according to specific criteria. Then, it improved a framework for evaluating these apps and applied this evaluation framework to the identified apps (Fig. 1 and 2). Finally, it compared the outcomes of the developed evaluation framework with the result of thematic analysis of apps user reviews. For more detail on the design part refer to. The search algorithm of iTunes and Google Play was biased toward apps’ titles and keywords, which resulted to excluding some unrelated apps. Even though the identified apps were the most popular ones on iTunes and Google Play, after applying the developed evaluation framework to the identified apps, none of the apps included all the elements of the framework. Analyzing the apps’ user reviews resulted in 11 categories that supported the identified evaluation elements. In addition, it resulted in new six categories (i.e. the ease of use, reminder, BCS, motivation, usable for all, and synchronization). These new elements should be added to future weight loss and diet apps and its evaluation framework. Fig. 2. The application of the evaluation framework on the identified apps. When it comes to selecting weight loss and diet apps from iTunes and Google Play stores, users should be aware that the search engines of these stores are might biased toward apps’ titles and keywords, and hence one might end up with some apps that do not really serve the intended weight loss and diet functions. In addition, users should be mindful that the most popular apps are not necessarily the most usable and effective. Therefore, popularity is by no means a measure of usability and effectiveness of apps. 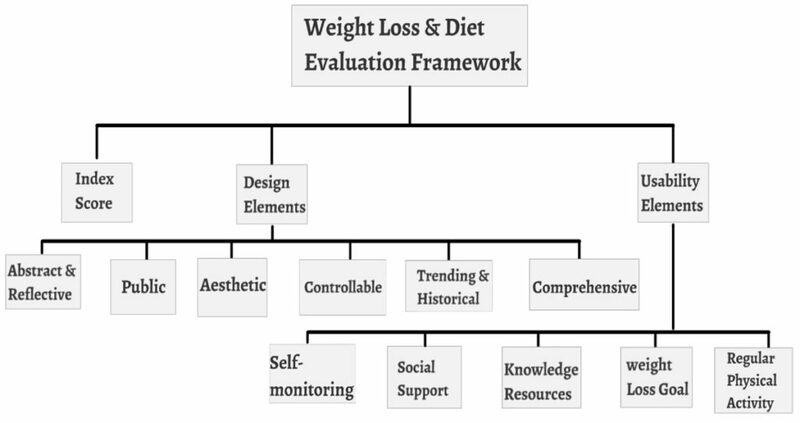 Users and developers of diet and weight loss apps should utilize the elements of the developed evaluation framework as a basis for their selection and development of apps. Popular Mobile Phone Apps for Diet and Weight Loss: A Content Analysis.